I recently started riding my bicycle indoors more using a Wahoo Kickr Core, an AppleTV and a 36in TV in the garage. The Kickr is a smart trainer, meaning it can not only measure the power (W) you put out on the bike, but you (through software) can also control the resistance of the trainer. This completely changes the game when it comes to training indoors, and there are some great software programs out there to make it fun riding in your garage. Here are the ones I use at the moment. This is a great program for serious training. They have a large library of workouts (intervals, strength, pedaling technique, endurance, intervals etc.) and they play great music and videos (mostly bicycle races) to keep you entertained. The on-screen instructions also help a lot and keep you motivated through the workout. I just completed the extremely painful 4DP test on The Sufferfest to test 4 dimensions of your cycling power. My current ‘passport’ looks like this. I guess I am an Attacker! This is a great program with a number of 4K recorded rides along famous routes (many of them the famous climbs). The program shows you a first-person view of the ride and controls the trainer’s resistance to match the conditions and gradient of the ride. It is a great way to explore the Alps and Pyrenees without lugging your bike to Europe! Just kidding. 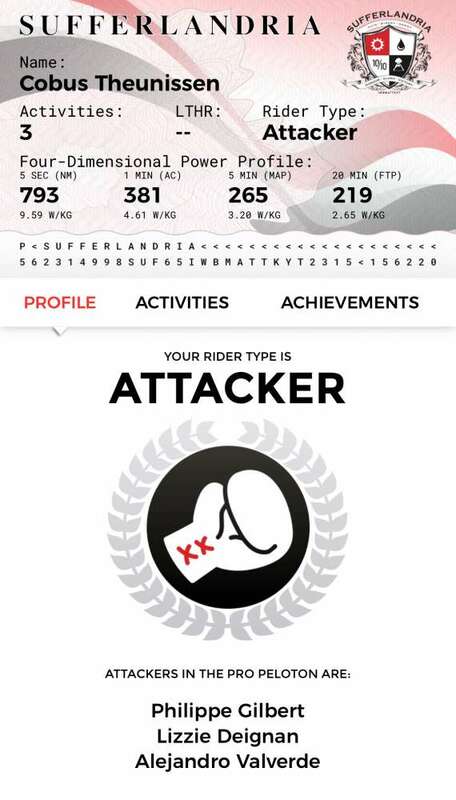 And of course it overlays all the stats and progress as you ride. A really great way to ride when it is raining outside. This one is very popular around the world. There are thousands of riders on the roads (virtual worlds) of the Zwift island, or the London route, the New York route, or the Insbruck route. What is cool about Zwift is that it is the only program where you can actually compete in real-time against other riders. You have an avatar in the program and as you ride, your avatar (and all the other riders on the road) moves at the speed that you are cycling. This means you can ride harder and pass the person in front of you, or you can actually draft behind someone. I have a few friends who also use Zwift, and when they start Zwifting, I get a notification and I can choose to jump on my bike and virtually join them on the road. Or even race them! Maureen also tried it the other day and she really likes it.